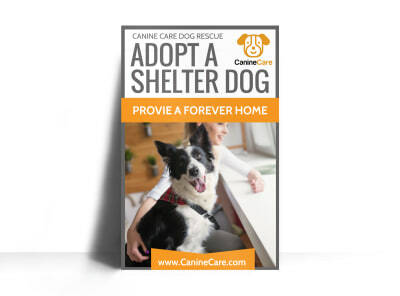 Whether you rescue greyhounds, groom poodles, or provide veterinary services for all sorts of critters, making your own pets & animals posters is fast and easy with our templates and online editor. 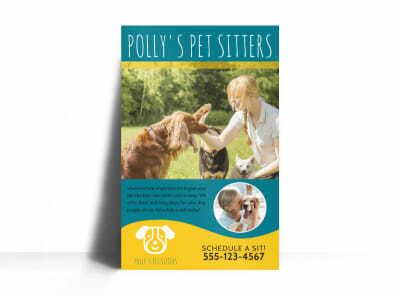 Design your own poster by selecting a layout, choosing colors and fonts you like most, and adding photos, text, and more. 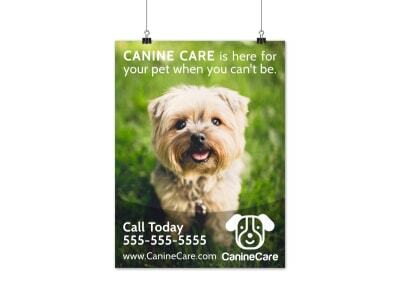 Posters are ideal for driving home a message from your storefront windows or reception room walls, and customizing your poster takes just a few keyboard strokes and mouse clicks. 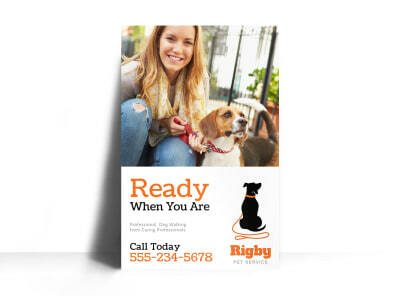 Get a print-ready design in minutes today. 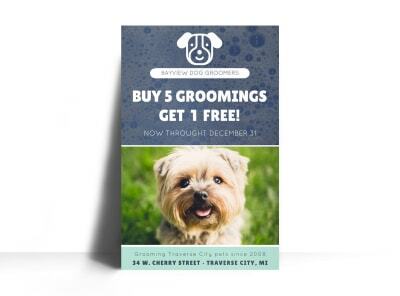 Generate a buzz in your local canine community by proudly displaying your grooming salon’s custom-designed posters all around town. 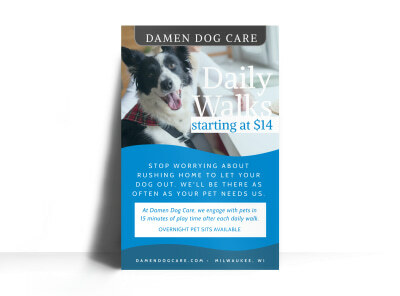 Our design team has produced a litany of customizable dog grooming poster templates to ensure you don’t stray from your initial vision. 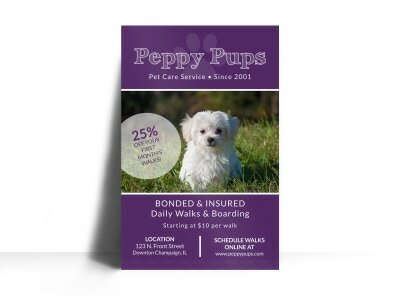 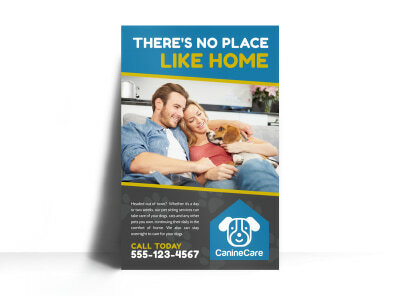 The tools in our online design editor enable you to easily create a one-of-a-kind poster that promotes your pet services and attracts new clients. 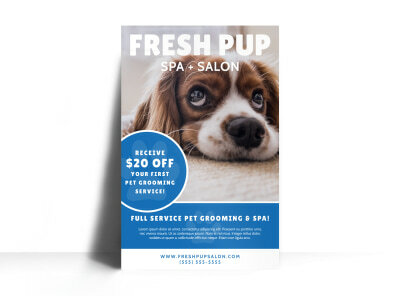 Best of all, you can also DIY a matching set of beautiful but informative posters to line the interior walls of your grooming salon from the wash bays to the register and everywhere in between. 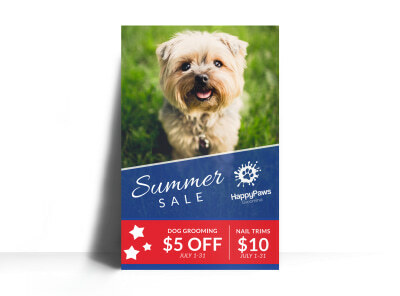 Just upload your logo and photos, enter your text, and send it to your favorite printer – or give our printing service a chance to win you over! 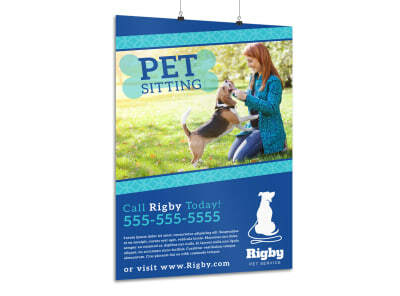 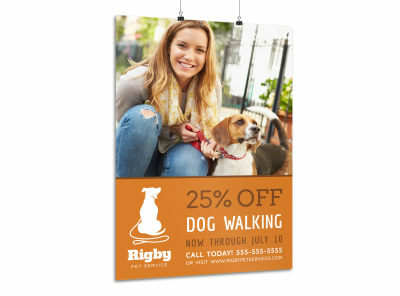 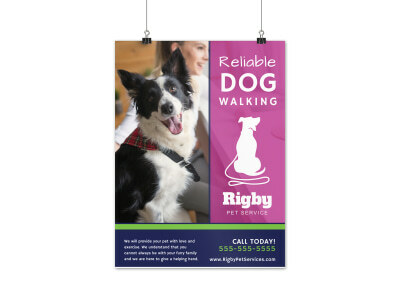 Catch the eye of a busy pet parent with a completely-customized dog walking poster that promises a human friend for Rover when they are unable to take him for a much-needed stroll during the day. 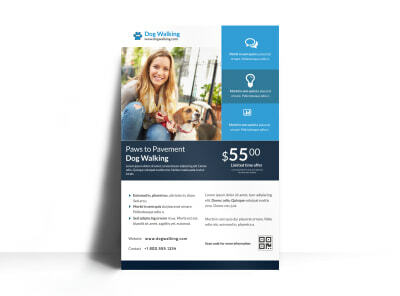 Our team of professional puppy-loving designers has put together an abundance of drool-worthy dog walking poster templates that will have Fido and Fifi barking at your door for a chance to be your new bestie! 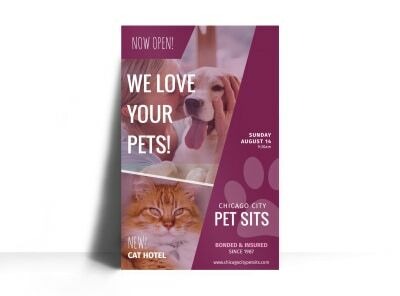 Use our online editor to give your chosen template that little extra pizzazz that will set you apart from the rest of the pack. 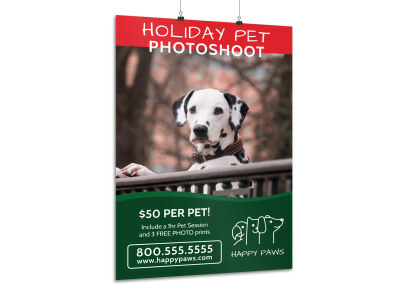 Draw in potential clients by uploading a professional photo of you in action and using it as the background for your poster. 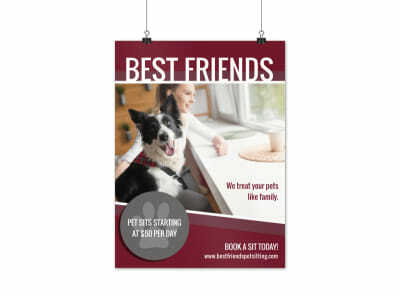 If you have any special training or experience with unique or hard-to-handle breeds, bring out those details that set you apart. 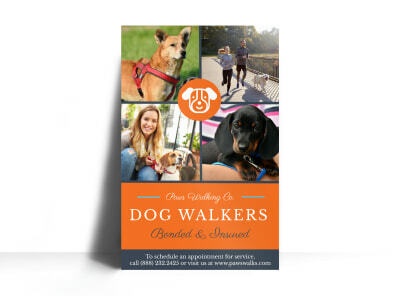 Include a candid photo of you with your own pup as a call-out, along with a brief bio and a description of your love for doggies. 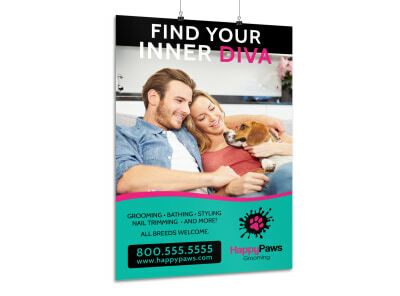 Once your design is done, we can even deliver your posters right to your door – no fetching required! 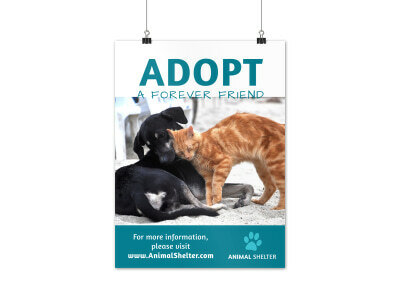 One of the big hurdles facing animal rescue organizations is the perceived convenience of “how much is that doggie in the window?” Overcome that obstacle by filling your community with custom-designed posters promoting your next pet adoption meet & greet, featured adoptable pets, or simply raising awareness of the need for more foster and adoptive homes. 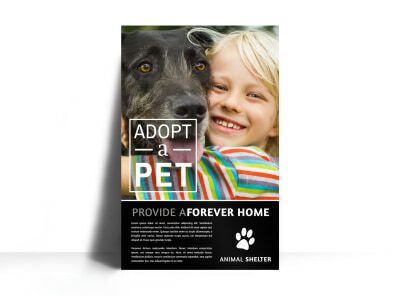 Browse our catalog of customizable pet adoption poster templates until you find your match, then use our online design editor to groom it from top to bottom. 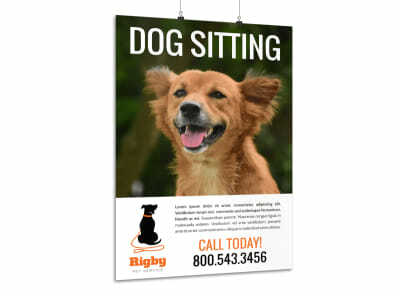 Upload pet photos that have that “waggly tail” effect. 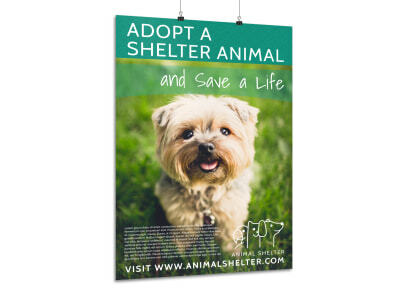 A great photo can give that long-term shelter resident pup the right exposure that gets him into his forever home! 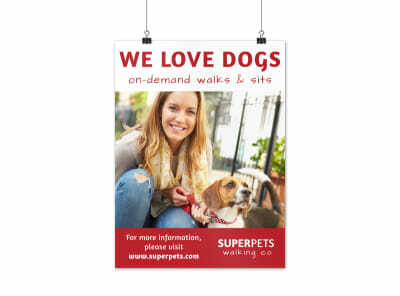 Print your posters anywhere you like, then start hanging them all over the neighborhood so that pets and parents can be matched faster! 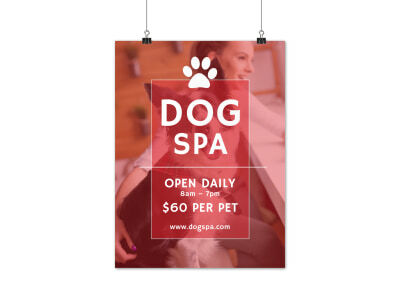 The key to running a successful pet grooming salon is being a place that doesn’t make Chance or Sassy dig in their heels (paws/claws) at the entrance. 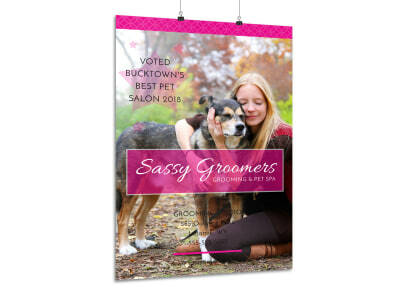 Customize a pet grooming poster that gives pet parents in your community confidence not only in your grooming ability, but especially in your salon’s pet friendliness. 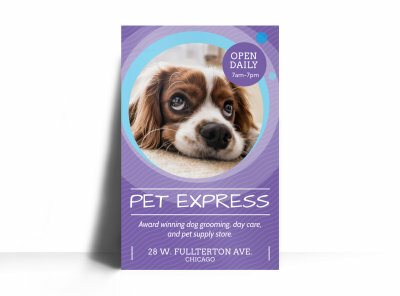 MyCreativeShop’s online editor enables you to use your pet styling skills to easily and quickly design a poster that compels clients to entrust their beloved dogs and cats to your expert care. 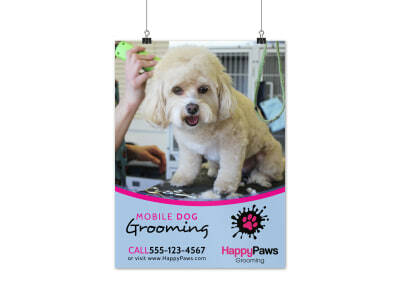 Upload a photo of a happy and satisfied non-human customer with their groomer and list the main services you offer (bath & brush, grooming, nail & ear care). 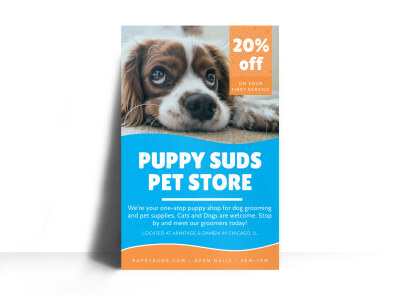 Once you’ve finished the design, get your poster printed and hung up at pet shops, grocery stores, and dog parks in your community! 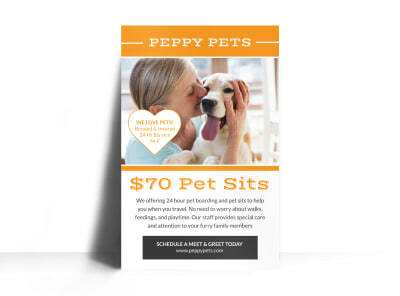 Your potential clients may be jetting off for a week-long escape to Fiji, heading to Minnesota for a snowy Midwest Christmas, or just working long hours with a long commute. 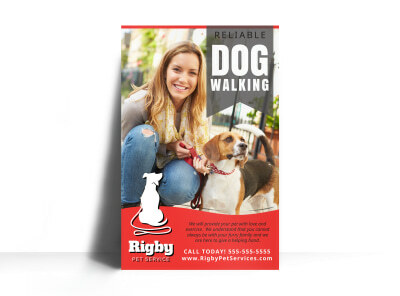 Whatever their reason, your pet-sitting services are in high demand. 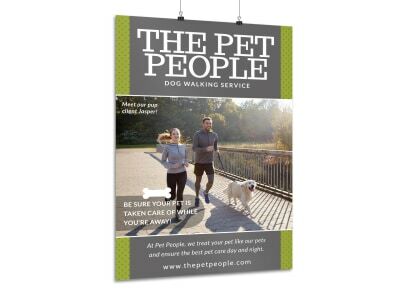 Make sure they find you before they jump on a plane, hit the road, or hop on a commuter train by customizing a fabulous pet-sitting poster that brings their dog, cat, or other small pet, right to your front door (or you to theirs, depending on whether you offer on-location care). 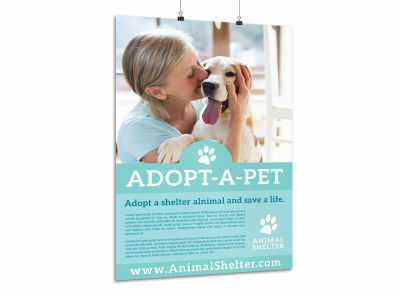 Upload a photo (or two) that best exemplify your love for pets of all kinds. 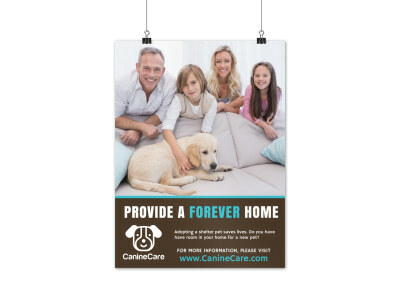 List the pet breeds/species you care for and services you offer. 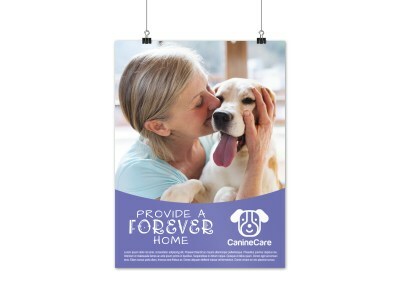 Using our online editor, your poster will reflect your heart for animals – even Mr. Rogers had to have someone feed his fish when he was away!